Taylor would be 9th vote for 2-J if needed. UPDATE: On the second reading, Brent Taylor voted 'No.' Presumably his commitment, noted in article, to be Number 9 in the case of 8 votes applied only to the third reading. As the Shelby County Commission convenes on Monday for its regular biweekly public meeting, one of the issues which has bedeviled it for many months now will probably get a virtually free pass. This would be a resolution on behalf of redistricting plan 2-J, which would divide Shelby County into 13 single-member County Commission districts. A resolution on behalf of the plan was re-introduced this month by Commissioner Terry Roland, who argued that it, more than any other redistricting plan discussed by the Commission, was likely to pass muster with Chancellor Arnold Goldin, who has the responsibility for adjudicating what has been a months-long deadlock on the Commission regarding redistricting. That being the case, said Roland, the Commission should go ahead and give the plan the 9-vote super-majority required for a redistricting plan by the county charter. Otherwise, he said, Goldin might approve 2-J on the basis of its having gained 7 votes on its third and final reading during the plan’s first run-through earlier this year. And that, argued Roland, might involve a ruling by Goldin underscoring the primacy of state law, which calls for only a simple majority to resolve redistricting disputes, over the county charter. The Millington commissioner warned that such a ruling might endanger the charter’s provision for a supermajority on other issues, notably on raising taxes above a certain level. So far, Roland’s argument seems to have carried the day. On the first reading of his new resolution for 2-J two weeks ago, he got 9 votes – including those of Chris Thomas and Wyatt Bunker, fellow Republicans who had been holding out for a multi-member redistricting plan which would essentially be an update of the present system. 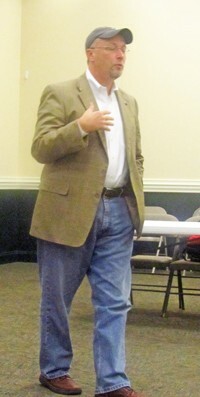 In a speech to the ultra-conservative Dutch Treat Luncheon group on Saturday, GOP commissioner Brent Taylor, another advocate of multi-member districts, added his conditional approval of Roland’s reasoning, and, while Taylor regards 2-J as “a bad plan for Republicans,” he promised to vote for it himself if it appeared the plan had 8 votes already. Meanwhile, both of the aspirants for the District 1, Position 3 seat now held by Taylor on an interim appointive basis, have indicated their support for 2-J. 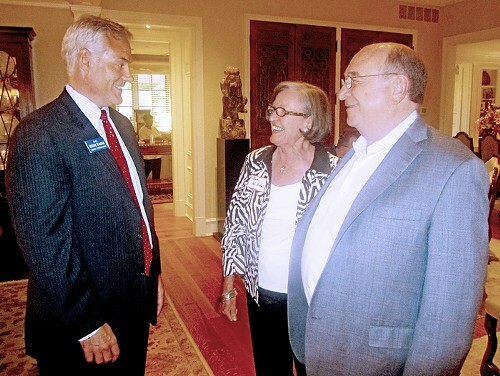 Republican nominee Steve Basar said Sunday at a fundraiser in his honor at the Germantown home of John and Sue Williams said he “could accept Plan 2-J as a basis for redistricting,” and Democratic nominee Steve Ross has filed suit on the plan’s behalf. The issue is in Chancellor Goldin’s court because three members of the Commission — Roland, Mike Ritz, and Walter Bailey — sued for a court ruling when the Commission was deadlocked on redistricting when the year-end deadline was reached without a finished plan. Roland and Ritz have since withdrawn from the suit, but Bailey remains, keeping that action, along with Ross’, active. Goldin has indicated he wants the Commission itself to resolve the redistricting issue, if at all possible. After today’s vote, there will be one more reading, a final one, and 9 votes for 2-J on that occasion would complete the redistricting process without need of a court ruling. GOP candidate Basar, here at Sunday fundraiser with hosts John and Sue Williams, adds his support to 2-J. Democratic opponent Steve Ross also endorses plan. Issue is whether replacement election can be held in November for departing Council members; Chairman Boyd and Council attorney Wade say no but have not released their legal basis.